Closed-circuit television (CCTV) has become synonymous with surveillance society and the widespread use of media technologies for contemporary regimes of power and control. Considered from the perspective of television’s long history, however, closed-circuit systems are multifaceted, and include, but are not limited to sorting and surveillance. During the media’s experimental phase in the 1920s and 1930s, closed-circuit systems were an essential feature of its public display, shaping its identity as a new technology for instantaneous communication. With the emergence of activist video practices in the 1970s, closed-circuit TV became a core feature for alternative experiments such as the Videofreex’ Lanesville TV, where it offered access to community-based media making. This use of CCTV as a tool for participatory media took place simultaneously with the rise of CCTV as a surveillance technology, which had been promoted under the label of “industrial television” already from the early 1950s on. Based on war-driven technological developments, industrial TV implemented televisual monitoring in industrial, educational, and military spheres decades before the global spread of surveillance cameras in public space. This talk by Anne-Katrin Weber explores the politics of CCTV as they unfold in different institutional and ideological settings. Examining television’s history beyond broadcasting and programs, it focuses on television’s multiple applications and meanings in public space – from the early presentation of television at World’s Fairs to community-based initiatives – and thus highlights the adaptability of closed-circuit technologies, which accommodate to, and underpin variable contexts of media participation as well as of surveillance and control. 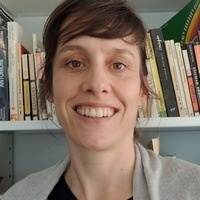 Anne-Katrin Weber is a postdoctoral fellow supported by the Swiss National Science Foundation and is a visiting scholar at MIT Comparative Media Studies/Writing. Her research examines the history of television outside broadcasting institutions. Currently preparing her first monograph titled Television on Display: Visual Culture and Technopolitics in Europe and the USA, 1928-1939, she is the editor of La télévision du téléphonoscope à Youtube: pour une archéologie de l’audiovision (with Mireille Berton, Antipodes, 2009) and an issue of View: Journal of European Television History and Culture (“Archaeologies of Tele-Visions and –Realities,” with Andreas Fickers, 2015).